Seduced by the challenge of an impossible case, the driven Dr. Carl Jung (Fassbender) takes the unbalanced yet beautiful Sabina Spielrein (Knightley) as his patient. Jung's weapon is the method of his master, the renowned Sigmund Freud (Mortensen). Both men fall under Sabina's spell and is based on a true story. This riveting, dark drama from director David Cronenberg brings together a prominent ensemble cast including Academy Award nominee Keira Knightley (Lead Actress, Pride & Prejudice), Academy Award nominee Viggo Mortensen (Lead Actor, Eastern Promises), Golden Globe nominee Michael Fassbender (Best Actor, Shame) and Vincent Cassel (Black Swan). CULVER CITY, CALIF. (February 13, 2012) – Based on the true story of renowned psychoanalyst Sigmund Freud, his determined colleague Carl Jung, and a disturbed patient who challenged the minds and work ethics of both men, A Dangerous Method arrives on Blu-ray™, DVD and digital March 27th from Sony Pictures Classics and Sony Pictures Home Entertainment. This riveting, dark drama from director David Cronenberg brings together a prominent ensemble cast including Academy Award® nominee Keira Knightley (Lead Actress, Pride & Prejudice), Academy Award® nominee Viggo Mortensen (Lead Actor, Eastern Promises), Golden Globe® nominee Michael Fassbender (Best Actor, Shame) and Vincent Cassel (Black Swan). A Dangerous Method premiered at the 2011 Venice Film Festival and was an Official Selection at the 2011 Toronto International Film Festival and 2011 New York Film Festival. The film’s star Viggo Mortensen also received a Golden Globe nomination for Best Performance by an Actor in a Supporting Role in a Motion Picture. 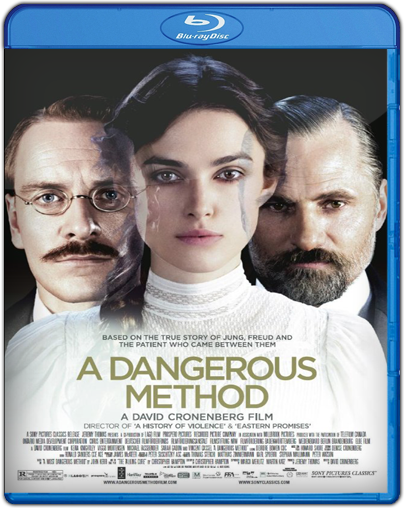 A Dangerous Method was directed by David Cronenberg (Eastern Promises) and written by Academy Award winner Christopher Hampton (Best Writing, Dangerous Liaisons). The film was produced by Academy Award winner Jeremy Thomas (Best Picture, The Last Emperor) and executive produced by Thomas Sterchi (Beyond This Place), Matthias Zimmermann, Karl Spoerri, Stephan Mallmann, and Peter Watson (Essential Killing). AFI’s Master seminar with David Cronenberg. Synopsis: Seduced by the challenge of an impossible case, the driven Dr. Carl Jung (Fassbender) takes the unbalanced yet beautiful Sabina Spielrein (Knightley) as his patient. Jung's weapon is the method of his master, the renowned Sigmund Freud (Mortensen). Both men fall under Sabina's spell. This film is based on a true story.